Perhaps the greatest effort we can put forth is to help make our profession better. To that end, in 2011, SDRSP began offering a $1000 scholarship available to any South Dakota K-12 teacher with 5 years experience. The idea was so popular (and economically supported by our members) that we now offer two scholarships a year! To qualify for this scholarship, the teacher must be working on an advanced degree or national certification. Please fill out the application and save it as a WORD or pdf document. E-mail the application and the two required essays as attachments to the address on the application form. Deadline for application--April 6. Please be sure the application is electronically submitted by that date! 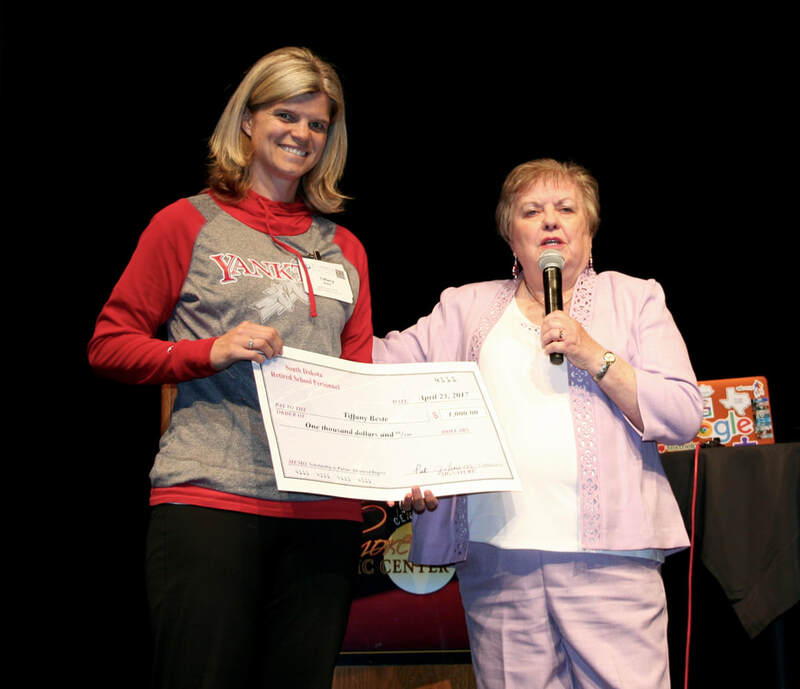 Teresa Remmers, 2nd grade teacher at Lincoln Elementary in Watertown, SD, was one of the scholarship winners. Making the presentation of her check and some fudge were Denise Ottenbacher, Watertown Area Retired Teachers President, (left) and Bill Zubke, state scholarship chair, Watertown (right). Teresa will pursue a Master of Science in Curriculum and Instruction Math Specialist from Black Hills State University, Spearfish, SD. Congratulations, Teresa! 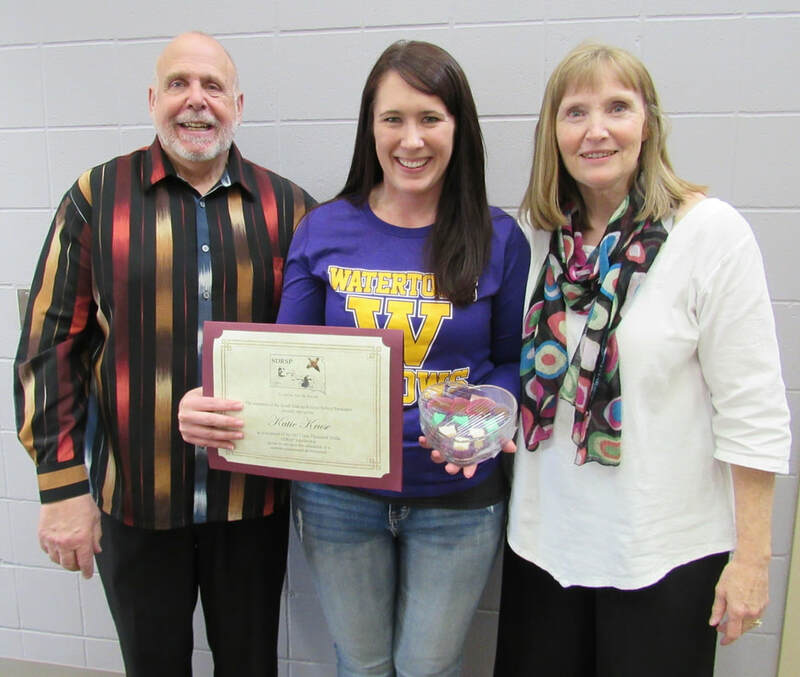 Danielle Harms, English instructor at Watertown Senior High School, is the winner of one of the scholarships given by SDRSP. She is being presented with her check and fudge by Bill Zubke, Watertown, who serves as the state scholarship chair. Danielle is enrolled in the PhD program at the University of South Dakota. Her dissertation will focus on literature and film from the Gulf, Iraq and Afghanistan Wars. 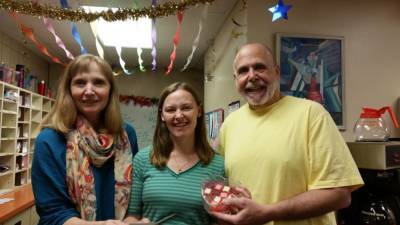 Congratulations, Danielle! Carrie Gutierrez, fourth grade teacher from Woonsocket, receives her check for $1000 and the omnipresent fudge from President Elect, Bill Zubke. Carrie was escorted to the front of the entire elementary school by her students to accept her award. Erin Oxford, St. Joseph School in Pierre, became our first private school teacher to receive the $1000.00 scholarship. Presenting the award to her is Hank Kosters, our legislative guru! In 2016, the SDRSP board created a one-time scholarship for $525.00 in memory of Ron Glover, our executive director's husband who passed away. Ron was an amazing man and supporter of our organization, and we the board could think of no better way to honor him than encourage one of our own to follow her dreams of an advanced degree. Pictured to the left receiving her award is Jennifer Rouse from Knollwood Elementary School in Rapid City, and Diana, who graciously made the presentation. What a fitting tribute to a wonderful man! Katie Kruse, Watertown Middle School, Watertown, SD. Presenting the award: Denise Ottenbacher, Watertown SDRSP President and an unidentified photo bomber.